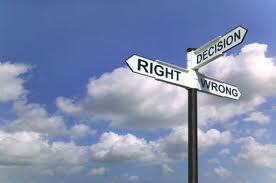 Sometimes we all struggle with making decisions, some big, some very small,but..... how do we come to make them? In fact, you are probably already doing that, at least unconsciously, so how about you let up on yourself a little, give yourself a break and go back to it when you feel more clear headed. A good way to help with this clarity is to visualise. Simply take each of the considered scenarios, and visualise what it would be like if you chose that path. See how it feels and how you react to each one. Then, probably your 'gut' or 'instinct', will tell you which one to choose. This is generally the right choice for you. You see, if the problem is not a logical one, like say...'Will I put petrol in the car as its in the red, before I go on this long journey?' Well, you can probably deduct you will run out and the car will stall, so you clearly know the consequences. Not all decisions are this logical, so this is when turning it over and over, hoping for the 'correct' answer may never happen. Its down to your gut now... Trust it. One things for sure, if you don't make any decisions, you are never in control of what happens next and you may never move forward. The lost important part is that we actually really 'think'. Not fret, stress and worry, getting ourselves all in a muddle, but when we are ready, we really think. 'Many years ago in a small Indian village, a farmer had the misfortune of owing a large sum of money to a village moneylender. The Moneylender, who was old and cunning, fancied the farmer's beautiful daughter. So he proposed a bargain. He said he would forgo the farmer's debt if he could marry his daughter. Both the farmer and his daughter were horrified by the proposal. So the cunning moneylender suggested that they let providence decide the matter. a) If she picked the black pebble, she would become his wife and her father's debt would be forgiven. b) If she picked the white pebble she need not marry him and her father's debt would still be forgiven. 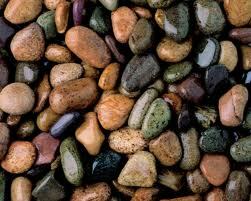 c) But if she refused to pick a pebble, her father would be thrown into Jail. They were standing on a pebble strewn path in the farmer's field. As they talked, the moneylender bent over to pick up two pebbles. As he picked them up, the sharp-eyed girl noticed that he had picked up two black pebbles and put them into the money bag. The Moneylender, then asked the girl to pick a pebble from the money bag. and expose the moneylender as a cheat. from his debt and imprisonment. The girl's dilemma cannot be solved with traditional logical thinking. Think of the consequences if she chooses. What would you recommend to the girl to do? 'The girl put her hand into the money bag and drew out a pebble. Without Looking at it, she fumbled and let it fall onto the pebble strewn path, where it immediately became lost among all the other pebbles. "Oh, how clumsy of me," she said. "But never mind, if you look into the money bag for the one that is left, you will be able to tell which pebble I picked." Since the remaining pebble is black, it must be assumed that she had picked the white one. And since the moneylender dared not admit his dishonesty, the girl changed what seemed an impossible situation into an extremely advantageous one! So remember, most problems DO have a solution. We simply have to think to find it. What do YOU do that you are not even aware of...yet?